Please sign the petition and send an email for Chicago School Libraries. Chicago's children deserve better! One thing that just infuriates us is when politicians use libraries as political props, especially when those same politicians have spent their careers closing or defunding them! We saw Cory Booker do it when he moved to defund libraries in Newark, New Jersey and then used a library as the background for his photo-op. 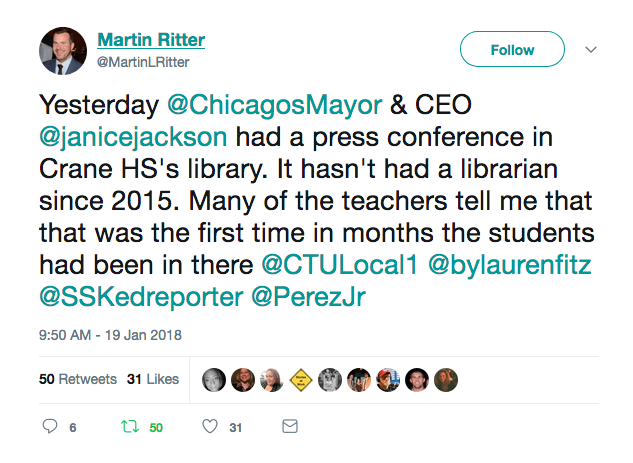 Now we’re seeing the same thing in Chicago where the Mayor and the CEO of Chicago Public Schools used a school library that they closed as a backdrop for a photo shoot. This is especially disheartening considering that they are the ones responsible for closing dozens of other school libraries across CPS. This is truly dishonest of these politicians. If they want to keep the library available as photoshoot set, then the least they can do is open it up for students at the school the rest of the time. It is one more reason that we’re asking you to share the petition for Chicago School Libraries with your friends and colleagues on Facebook and Twitter, and to ask them to use it to send an email to CPS Board, the CEO, and to the Mayor. The students need access to their libraries, and those libraries need school librarians in there working with those students. PS- Help us reach more Americans to support libraries by inviting your friends and family to like us on Facebook! We'll even send you some great library art in the mail if you let us know. This is insanity, for this, you lose my vot, mayor.